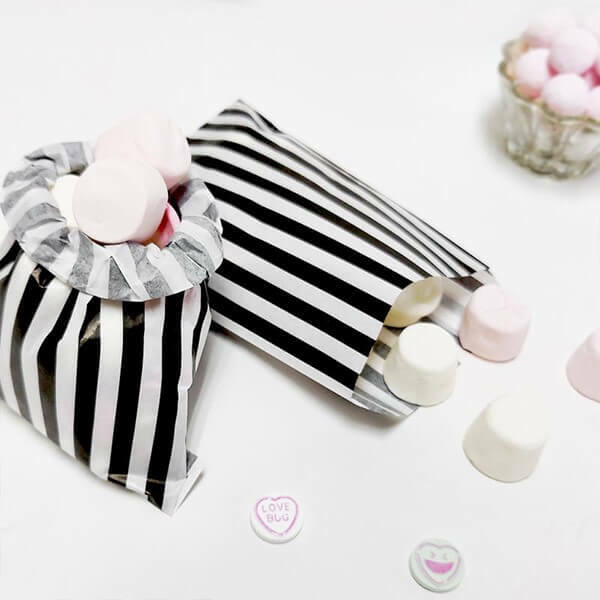 Our charming Black Candy Stripe Sweet Bags are a great part of our best selling candy stripe paper bag range and fantastic for a wide range of uses! 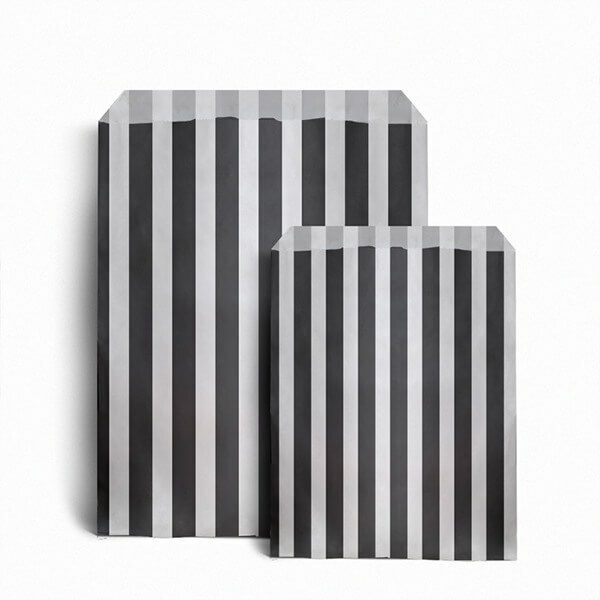 These Carrier Bag Shop classics are made from strong 36gsm Kraft Paper and are printed with an attractive yet traditional stripe design all over. They are sourced from Europe and are of exceptional quality. 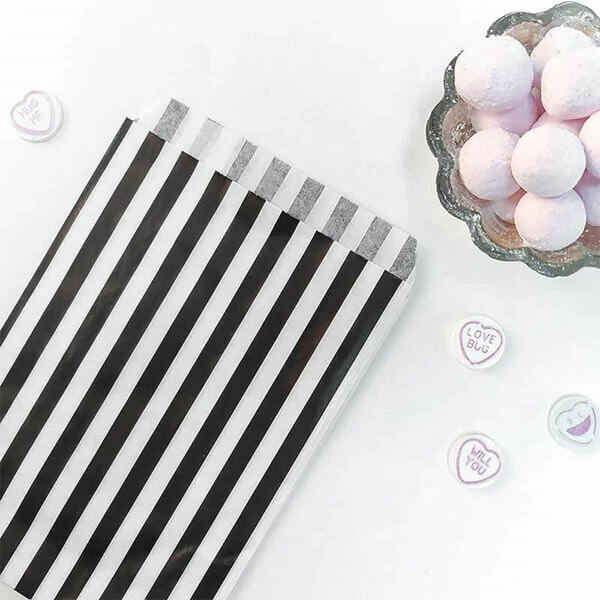 The inks are water based and the paper is fully recyclable making them a great eco-friendly option. Unlike some on the market - these bags are not strung in the corner in bundles of 100 so the bags won't get damaged or torn in the corner and look untidy. 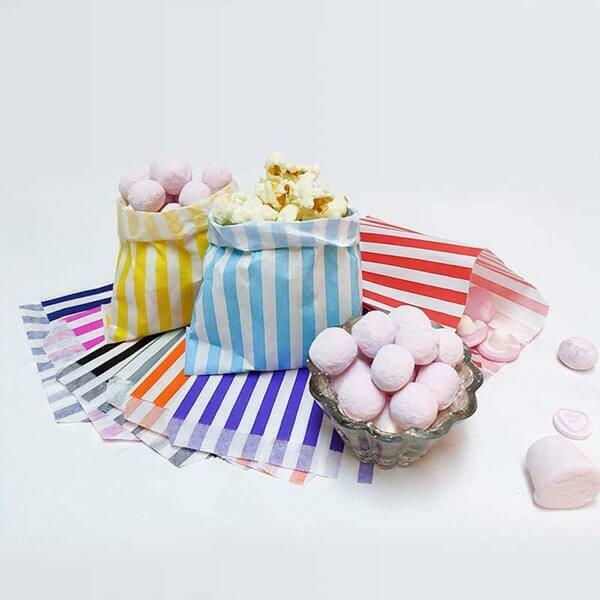 These bags are great for Greeting Cards, Sweet Shops and anyone who wants to achieve a nostalgic feel - and now we commonly sell them for weddings, parties and events. We have researched extensively and have found our prices to be the most competitive online. If you find the bags cheaper elsewhere then call us on 020-3002-9960 - and don't forget to check out our Bulk Packs of 10,000 bags. Looking for another colour? - Check out the range of 11 other colours here. Bags are packed in bundles of 100 and outer packs of 1000. If you require any other information not listed above we'll be happy to help - call us on 020-3002-9960. Please remember the picture is for illustrative purposes only - if colour is important, please ask for a free sample. Weddings, parties and other events. To see a more creative uses of these bags check out our boards on Pinterest! To see our reviews please visit our Trustpilot page. We can print a great design incorporating a Striped Paper Bags for you! Minimum Quantity: A simple 1 colour print from as little as 5000 bags. If you require something a little more complex or require over 5000 bags, we can have the bags printed using a full printing press. If you need a special size we can even have the bags made to your exact specification. Simply fill in our Quote Request From or Call Us on 020-3002-9960 and we will get you a Free, No Obligation Quotation.